Welcome to the market. Ordering takes place each week from Friday at 9 p.m. to Monday at 10 a.m.
You may search for products by category, by best sellers, or by farm. Happy Shopping! Feedback Button – click here to let us know about your SCFM experience. Your feedback helps us grow. The Market Managers have temporarily disabled ordering at this market. Nature's Wealth "For Your Health"
Perfect for gift giving, we are offering gift certificates for our delicious grass fed beef. We have put $25. Denomination on the market but they are available in any denomination. Just contact us! These may also be used to purchase Pig Mountain pastured pork products. Purchasers should contact us to arrange delivery. Of course they are always able to pick up on the farm an see our commitment to humane and sustainable raising of our animals. This is a gift certificate for items sold by Dogwood Valley Greenhouse. The certificate you receive will be suitable for gift-giving. Just fill in the name of the receiving person. The gift certificate is sold in increments of one dollar. When you order, place a number equal to the dollar amount you wish to buy in your shopping cart. If you wish to purchase more than one gift certificate, leave a comment with your order (during the checkout process) explaining how you want your amount divided. Rooted Here is more than just an online market, it is an organization dedicated to growing the local food economy so that farmers can make a living wage and so that everyone has access to fresh and healthy local foods. Visit our website "rootedhere.com":http://rootedhere.com to learn more about the organization and our projects. The organization depends on member support and donations. Basic membership costs $35.00, and aside from receiving updates on our projects you will also have a vote at membership meetings and can help to make a difference in our local food economy. If you would like to give more than the basic amount please make note in the comment section. Thank you for your support. Rooted Here is more than just an online market, it is an organization dedicated to growing the local food economy so that farmers can make a living wage and so that everyone has access to fresh and healthy local foods. Visit our website "rootedhere.com":http://rootedhere.com to learn more about the organization and our projects. The organization depends on member support and donations. Basic student membership costs $25.00 and includes voting privileges. If you would like to give more than the basic amount please make note in the comment section. Thank you for your support. 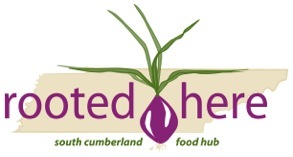 The South Cumberland Farmer’s Market is a project of rooted here, which is an organization focused on building a vibrant and just local food economy. To learn more about rooted here visit our website at rootedhere.com.